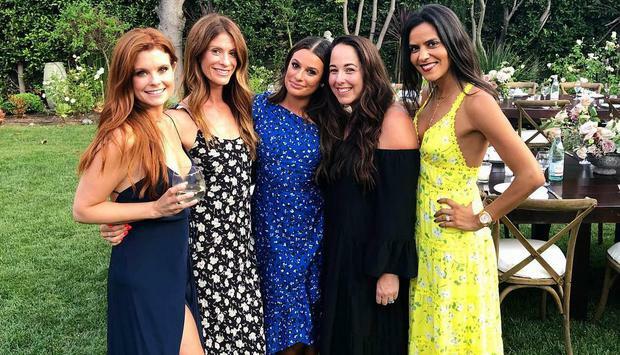 The stars came out for Glee actress Lea Michele's engagement party this weekend, as she celebrated her upcoming nuptials with fiancé Zandy Reich. The happy couple were joined by a host of famous faces as they celebrated their upcoming wedding, including Lea's girl friends Hilary Duff, Ashley Tisdale and Emma Roberts. "The outpouring of love from our friends and family who showed up for us today and threw us the most epic and beautiful engagement party we could have ever asked for was truly so incredible," Lea shared on her Instagram Stories. "Z and I love you all and are forever grateful." Lea added that just the day before her engagement party she had found her wedding dress - which coincided with her parent's 38th wedding anniversary. "Z and I look up to you both so much and we love you both more than you know," she said, in a tribute to her parents. The bride-to-be took to Instagram back in April to announced her engagement, flashing her stunning four carat diamond ring. The elegant, elongated radiant cut ring was personally designed for her by fiancé Zandy, who had recruited Leor Yerushalmi and The Jewelers of Las Vegas to work on the piece. When he gave her the ring, the actress didn't quite believe what was happening: "I was so surprised, I kept saying, 'Stop joking around, stop joking around!' I keep thinking [the ring] is borrowed and I have to give it back at some point," she said. While the exact date of the wedding has not been revealed, the star has said that she has taken to wedding planning easily, and revealed that she is using social media for inspiration for the day, and making organising the celebrations a 'priority'. "I’m also slowly looking at Pinterest and finding things I like and that excited me. It’s a really incredible time. I’m so grateful and really excited for everything. The 31-year-old singer and actress was dealt a tragic blow in recent years when her ex-boyfriend Cory Monteith passed away in July 2013 at the age of 31. Speaking about how she tried to overcome her heartache, she shared: "I have great support from my family. My parents raised me with a really strong backbone and a really good head on my shoulders. My mom is my safety net in life, so I always know I can reach for the stars and push really hard. My mom and dad will always be there to catch me if I fall."